Work on Stonehaven’s long-awaited flood defences has been delayed and is not now expected to get under way until later in the year. It had been hoped to begin construction of the multi-million pound protection scheme in the summer. But more companies than expected have tendered for the project, which is designed to protect homes and businesses forced to evacuate on several occasions by severe flooding around the River Carron. A shortlist of potential contractors has been drawn up. 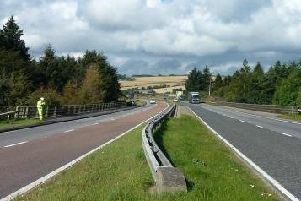 Aberdeenshire Council’s policy and resources committee approved funding for the scheme at an estimated cost of £16 million in September, 2014. The project will include alteration to five bridges along the River Carron, removing, replacing and raising the Red Bridge and Green Bridge, repositioning the Green Bridge, removing, refurbishing and reinstating the White Bridge in a raised position, replacing the Bridgefield Bridge parapet with a reinforced glass type material and raising and widening the Beach Bridge. It will also involve construction of flood walls between the Red Bridge and the river mouth, the island downstream of the Green Bridge will be removed, installation of two higher capacity culverts on the Glaslaw Burn and a new culvert under the gardens of Cameron Street, and construction of a new pedestrian walkway from Bridgefield Bridge to the beach. While it had been hoped work would start on the ground this summer, the local authority says the first stage of the tender process has taken longer to complete, given the level of interest from interested firms. The shortlist is down to five and the project team is now entering the next phase of the tender. It is hoped that a preferred bidder will be chosen by the autumn and that work can then start on the ground later in the year. There is an estimated construction timescale of around 24 months. Landowners directly affected by the work are being contacted by members of the project team to brief them on the next stage of the project and what that will mean for them. Principal engineer, Rachel Kennedy, said: “While the timescale we initially predicted has slipped by a few months, that’s to be expected with a project of this size and complexity and given the significant level of interest from firms wishing to deliver the scheme on the council’s behalf.